The sprayers I recommend are products that dispense the spray mix that you have created. 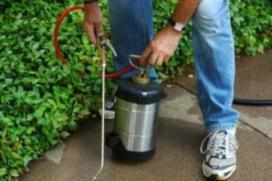 Pump-up sprayers and trombone sprayers are the least expensive and good for small jobs. I don’t often recommend hose end sprayers. They do the mixing for you, are inconsistent, often clog up and have a tendency to fall apart. They are okay for spraying microbe products, but not for fertilizers where the concentration and coverage are importantI don’t often recommend hose end sprayers. They do the mixing for you, are inconsistent, often clog up and have a tendency to fall apart. They are okay for spraying microbe products, but not for fertilizers where the concentration and coverage are important. Q: Is there anything that can be used in a pump sprayer to neutralize any pesticide or herbicide that may have been used in the sprayer? It was given to me by a friend, and he can’t remember exactly what may have been in it. E.H., Dallas. A: Thanks for the intelligent concern but I may not have a foolproof solution to the detox. Washing the sprayer out with Gro Safe from NORIT would probably eliminate any contamination but would cost more than buying a new sprayer. Filling it full of wet zeolite would be the second best choice but then in both cases what do you do with the contaminated material? Sprayers that have never had anything in them but organic products are the best solution, isn’t it.